George Gillett (L) and Tom Hicks pose with a team scarf at the Anfield stadium in Liverpool. 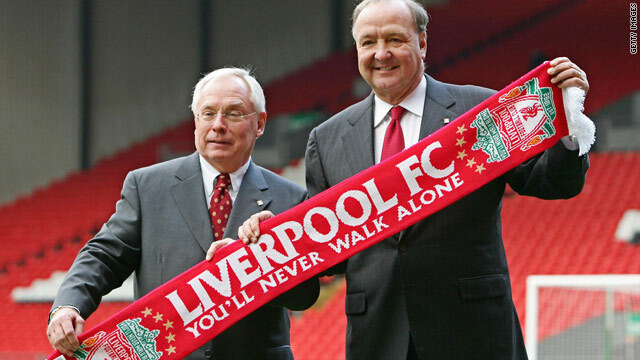 (CNN) -- Liverpool's official supporters club is hoping the intervention of former chairman David Moores will hasten the departure of unpopular owners George Gillett and Tom Hicks. In a 3,155-word letter to the Times newspaper, Moores said he "hugely regrets" selling the English Premier League team to the American pair in 2007 and called on them to sell up as soon as possible. Under Hicks and Gillett, Liverpool's debts have spiraled to $507 million and the club's finances are further imperiled by the failure to qualify for next season's European Champions League. Hicks told Sky Sports News on Wednesday that they hope to sell the club by the end of the year. James McKenna, spokesperson for the "Spriit of Shankly" supporters club, said he hope Moores' letter will encourage the banks who have loaned money to the Americans to put pressure on their clients to sell. "If the previous owner admits it's a mistake, and the fans all see it as a mistake then surely those who allow them to stay in control, like the Royal Bank of Scotland will realize that," McKenna told CNN. "I think if anything it gives a bit more impetus to fans to ramp up the pressure on Hicks and Gillett. It is about time they walked away." In his letter, Moores explained the checks that were run on the Americans before they were allowed to seize control, but admitted that more could have been done to investigate where their money was coming from. Once we fall out of the top four and we are not meeting the same revenues, how are we going to meet these interest repayments of £110,000 a day? "I call upon them now to stand back, accept their limitations as joint owners, acknowledge their role in the club's current demise, and stand aside, with dignity, to allow someone else to take up the challenge," Moores concluded. "Don't punish the club's supporters any more - God knows they've taken enough." McKenna described the Americans' reign as "disastrous" and said there was a real danger of the club falling to financial ruin, unless new backers are found soon. Portsmouth became the first Premier League club to enter administration last season. "Once we fall out of the top four and we are not meeting the same revenues, how are we going to meet these interest repayments of £110,000 a day?" he said. "It simply isn't sustainable at the present time and it will become very quickly a real risk of administration if the situation worsens." With Liverpool out of Europe's top competition and little money available for new recruits, the British media has speculated that manager Rafael Benitez will be forced to sell key players such as Spanish top scorer Fernando Torres and England midfielder Steven Gerrard. "There's a real fear that players may be forced out because there's no investment," said McKenna. Steven Gerrard, Fernando Torres, Pepe Reina and Javier Mascherano - world-class players like that need to be playing in a world-class team, challenging and winning honors year in year out." Speaking to Sky, Hicks said the club was in "healthy" financial state and did not need to sell Gerrard or Torres. How are U.S. owners faring in English football?